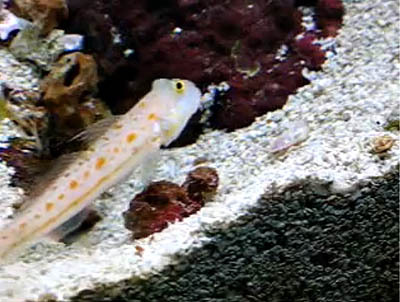 A Breeding Diamond Gobies Video was sent to us by a new member. The video begins with 100’s, if not more, of Diamond goby larvae swarming around a tank. After a few moments of showing just how many of them hatched, we are taken back 24 hours. We then see the Diamond Goby couple attending to their nest and preparing it for the upcoming event. Then begins the mad rush by the mated diamond gobies to hide and protect the nest. The next few minutes cover the hard-working goby mindfully working to disguise the home of it’s impending newlyhatched.